With the ponies about to hit the big screen these My Little Pony Halloween costumes for kids are going to be the thing to wear for trick or treating this year! My daughter is CRAZY for My Little Pony at the moment and if yours is too then you might want to check out this selection of My Little Pony Halloween costumes for kids together. You know just to make sure you pick out the right pony when you choose her costume! I can never quite sort my Rainbow Dash from my Twilight Sparkle! Pinkie Pie is the party loving pony and she’s a fun and sweet character. Her costume features a pink tunic top. Some of these tops will have an image of Pinkie Pie across the front of it. You’ll find a lot of attention to detail with her costume – such as the puffy sleeves. Many of them even feature the delightful pony tail that can be removed from the costume. The bottoms of most of these costumes are leggings but if your little girl prefers you can pick out one of the Pinkie Pie costumes that have a gorgeous tutu style skirt instead. To round out the outfit, some of these costumes come with the pony headband so that your daughter can also have ears like Pinkie Pie. Next on the list of much loved Pony characters is Twilight Sparkle. Any little girl would love to dress like this magical Pony. What you’ll find with most of the costumes created after this Pony is like the name says – the outfits will sparkle. Some of them are designed so that when the child moves, the clothes appear to sparkle. Some costumes will have more accessories than others, such as including the wings and detachable tail along with the headband to give your child ears like the beloved Pony. But even if you don’t find one that gives you these extras, you can still get them as a separate purchase. You can also purchase an Equestria Girl’s Twilight Sparkle outfit if your daughter prefers that style. And we can’t forget about Rainbow Dash! 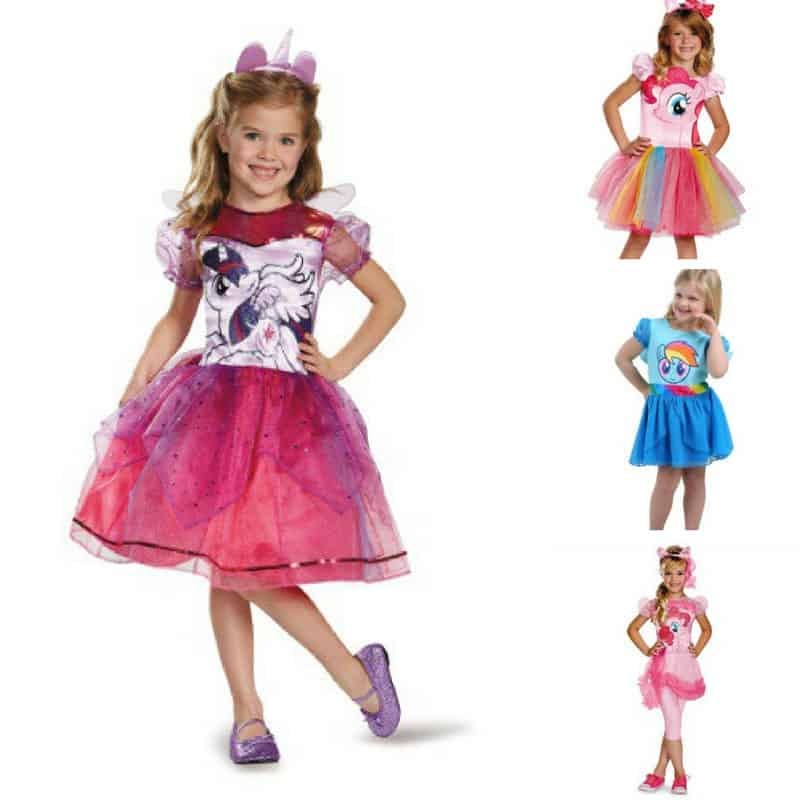 As with the other My Little Pony costumes the styles and options are very similar, and accessories or sweatshirts are also available. If you want to have a matching outfit there are My Little Pony costumes for women too. The outfits have a bit of a disco vibe to them with wigs, and leg warmers. Rainbow Dash’s costume of course comes with wings too!